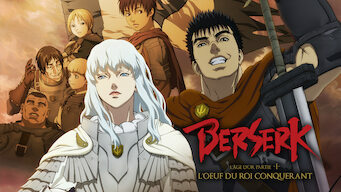 How to watch Berserk: The Golden Age Arc I - The Egg of the King (2012) on Netflix Netherlands! Yes, Berserk: The Golden Age Arc I - The Egg of the King is now available on Dutch Netflix. It arrived for online streaming on March 8, 2019. We'll keep checking Netflix Netherlands for Berserk: The Golden Age Arc I - The Egg of the King, and this page will be updated with any changes. Loner Guts is recruited by Griffith and his band of mercenaries, but their ensuing success as a full-fledged army could lead to a horrible fate. A legionnaire who works for nobody is about to work everybody. They are legion. But what is the endgame?